Asian House Martin (Delichon dasypus) must be a candidate for vagrancy to Western Europe. 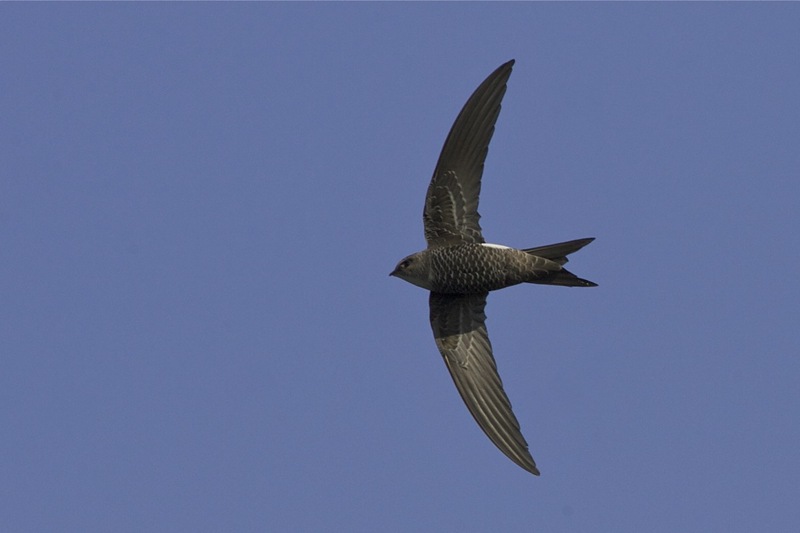 At least one of the three subspecies is a strong and long distance migrant. However, looking very similar to Northern House Martin, its common European sister-species, how many people would be able to identify one? 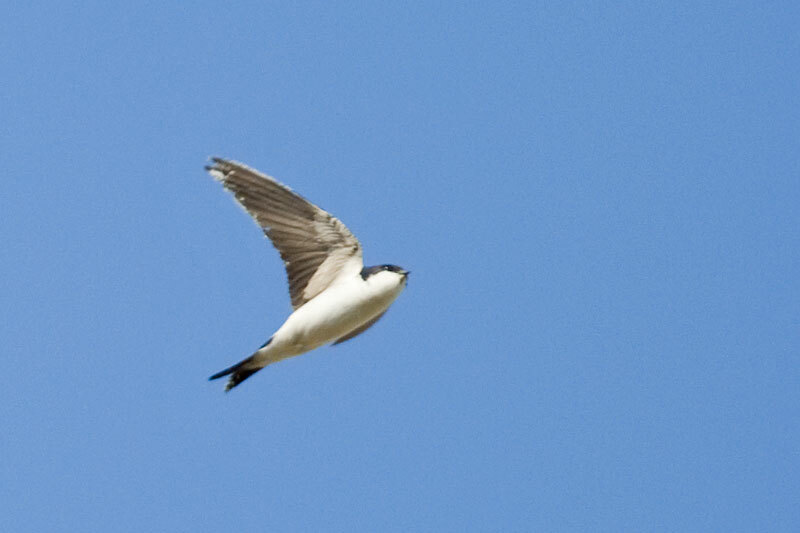 The nominate subspecies of Asian House Martin is perhaps the most likely to wander. It breeds in southeast Russia, the Kuril Islands, Japan and Korea and migrates through eastern China to winter in the Malay Peninsula, Borneo, the Philippines, Java and Sumatra. Ssp cashmeriensis breeds in the Himalayas from Afghanistan east to Sikkim and northwards into Tibet and western and central China. 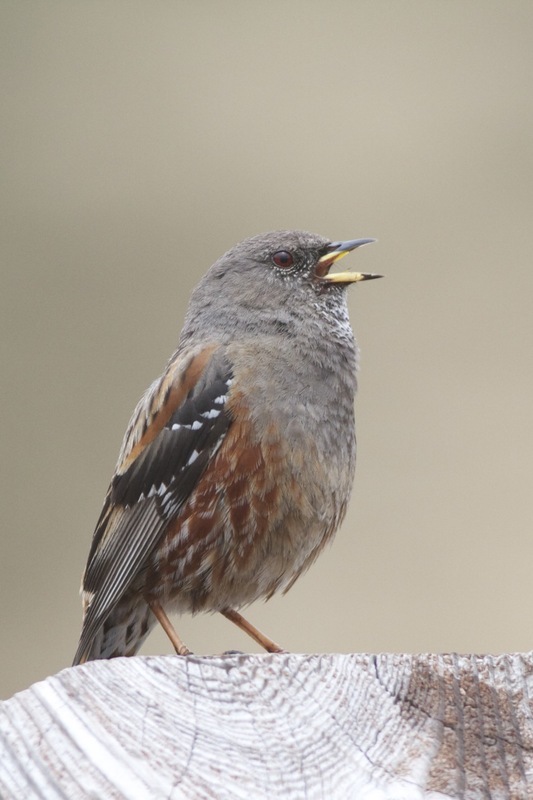 It is a short-range migrant, mainly wintering at lower altitudes in the foothills of the Himalayas. 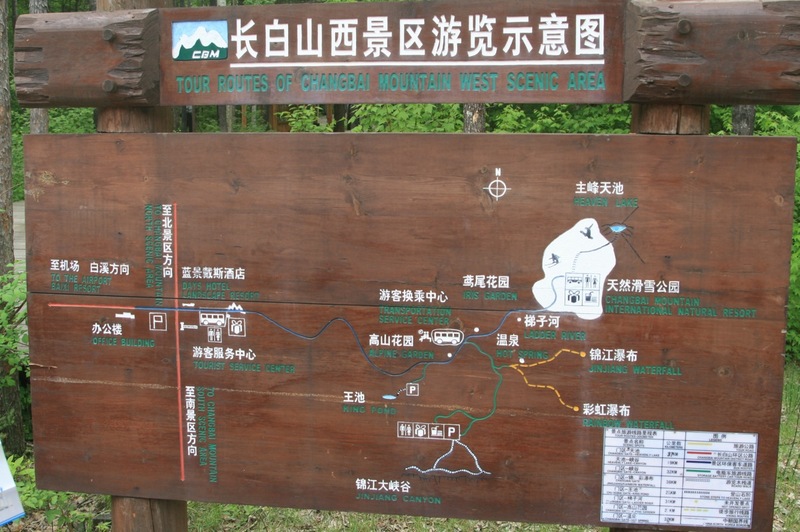 The third race, ssp nigrimentalis, breeds in southeastern China and southern Siberia. 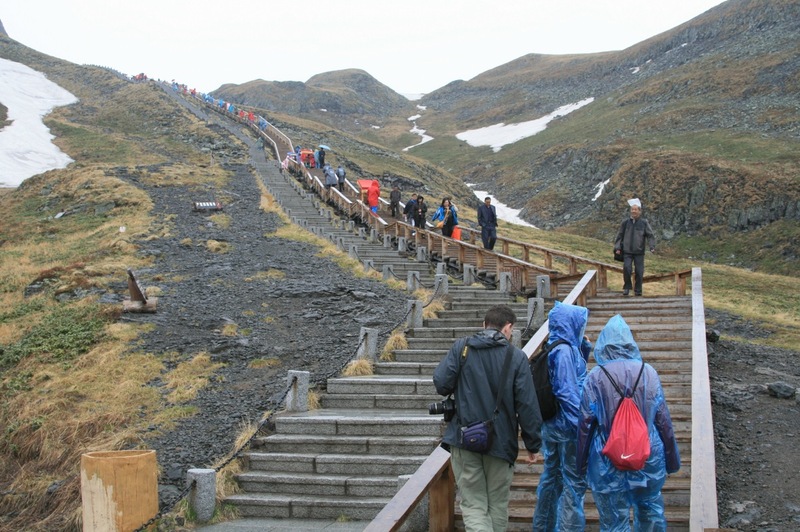 Its wintering grounds are unknown, but birds in Taiwan apparently just move to lower altitudes in winter. 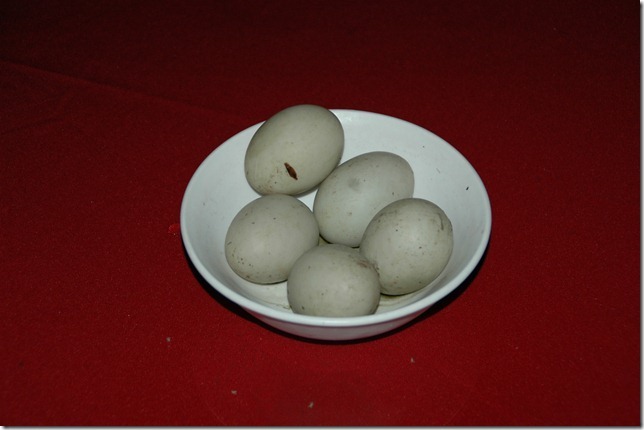 In eastern China any sighting of a House Martin is notable. I have seen a handful of both Asian (presumably the nominate subspecies) and Northern House Martins at Laotieshan in Liaoning Province but, in a sign of just how scarce they are in this region, I have still not seen one of either species in Beijing (they are passage migrants and seen in small numbers each spring and autumn – clearly I just haven’t been trying hard enough!). My recent visit to Chang Bai Shan in Jilin Province provided an opportunity to get to grips with Asian House Martin as several pairs were nest-building on our hotel, allowing some fantastic views. 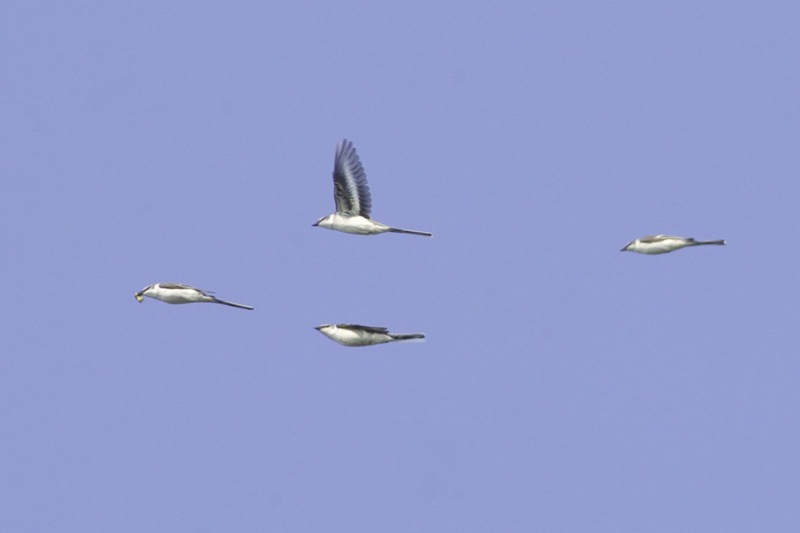 Capturing any hirundine in flight with a camera is never easy, and the images below won’t win any prizes, but they do show some of the features to look out for in separating Asian House Martin from Northern House Martin. To the European readers of this blog, it’ll be worth making a mental note of these features when checking out those late autumn migrants….! Asian House Martin, Laotieshan, 27 September 2011. 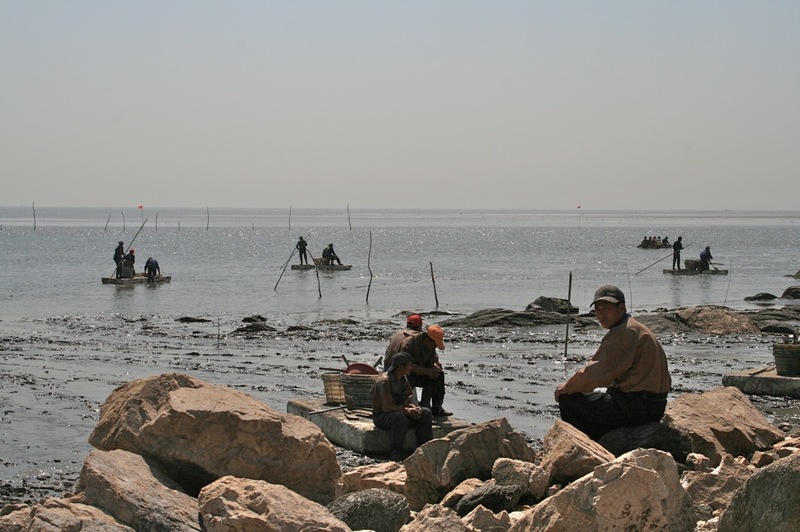 A typical view of a migrant. 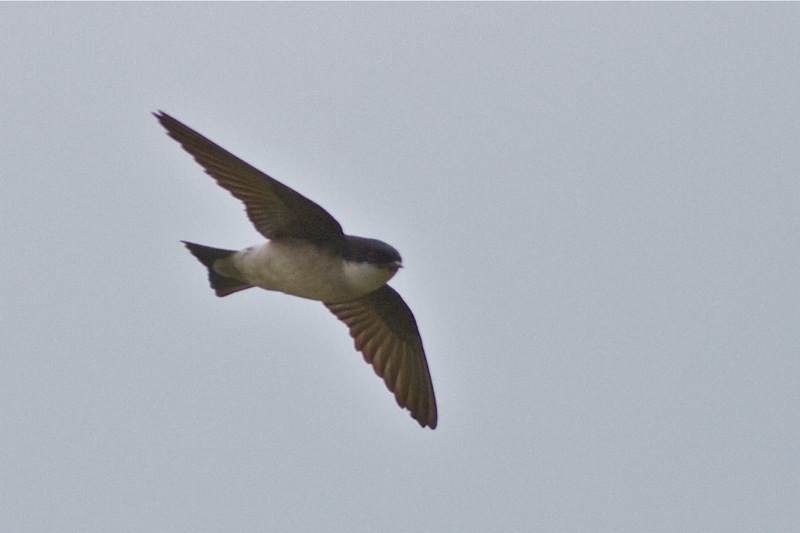 Note the dark underwing coverts – a good feature of Asian House Martin – as well as the dusky-looking underparts and dark neck ‘collar’. Asian House Martin, Chang Bai Shan, 3 June 2012. A closer view. This image was taken in heavily overcast conditions but still shows the contrasting dark underwing coverts and dusky underparts with white throat. There are several differences between Asian and Northern House Martin that should make identification relatively straightforward if seen well. Structurally, Asian House Martin is smaller, more compact and squarer-tailed than Northern but these features aren’t necessarily easy to ascertain on a single bird. Perhaps the best feature, and one that I have found very helpful in the field, is the colour of the underwing coverts. 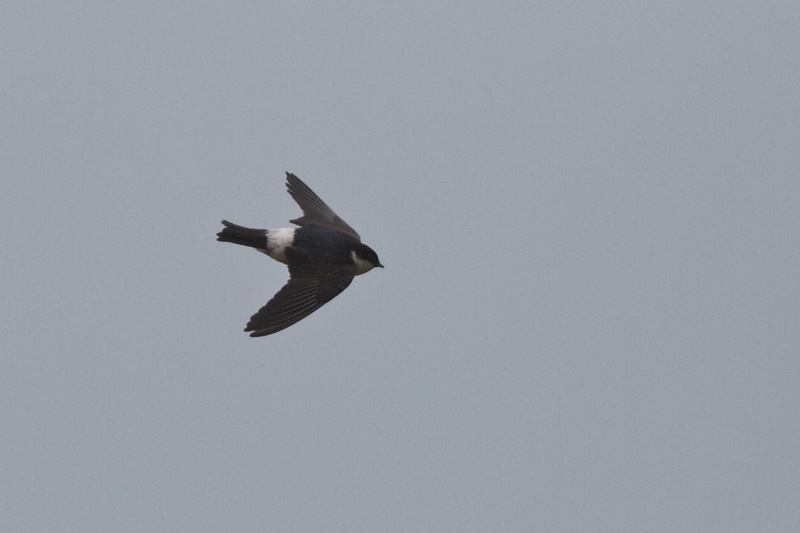 In the images above, taken in sunny and dull conditions respectively, one can see the relatively dark underwing coverts, a consistent feature of Asian House Martin. 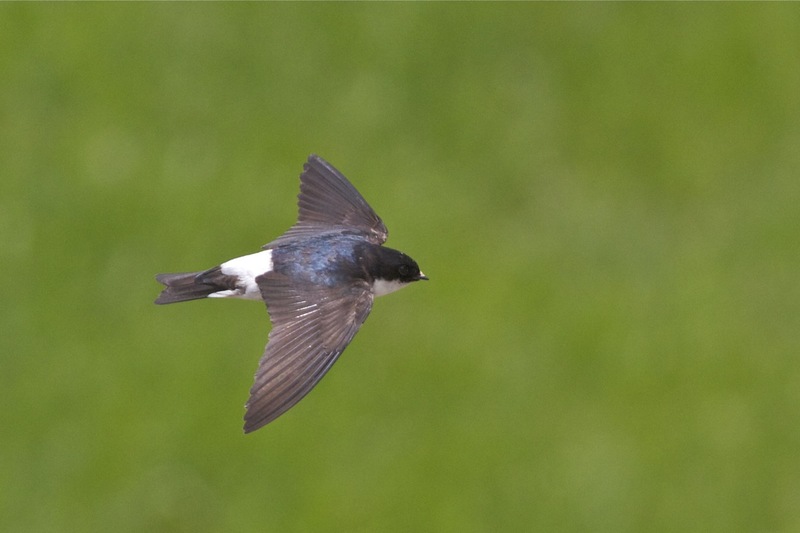 Compare with this image of a Northern House Martin. 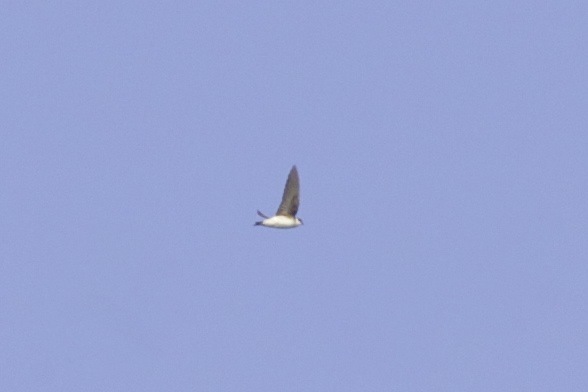 The paler underwing coverts of Northern are not usually as prominent as shown in this linked image (taken in strong light) and can often appear concolourous with the rest of the underwing but a House Martin with obviously dark underwing coverts should be Asian. Another subtle feature to distinguish these two species is the amount of black on the face. 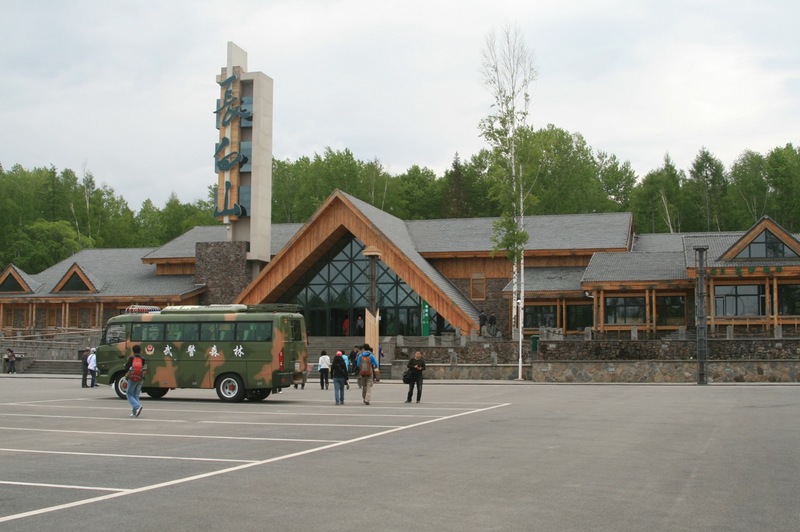 Compare the image above of Asian with this image of Northern. The black on the face generally extends a little lower on Asian. Another feature is the rump. On Asian House Martin the white rump is usually relatively small and can appear ‘flecked’ with dark streaks, as in the above image. 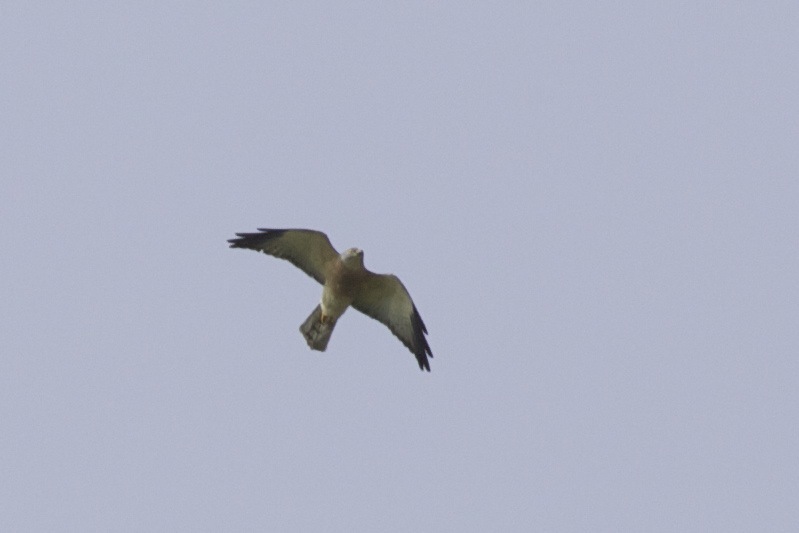 On Northern the white rump is larger (due to more of the uppertail coverts being white) and is usually clean white. 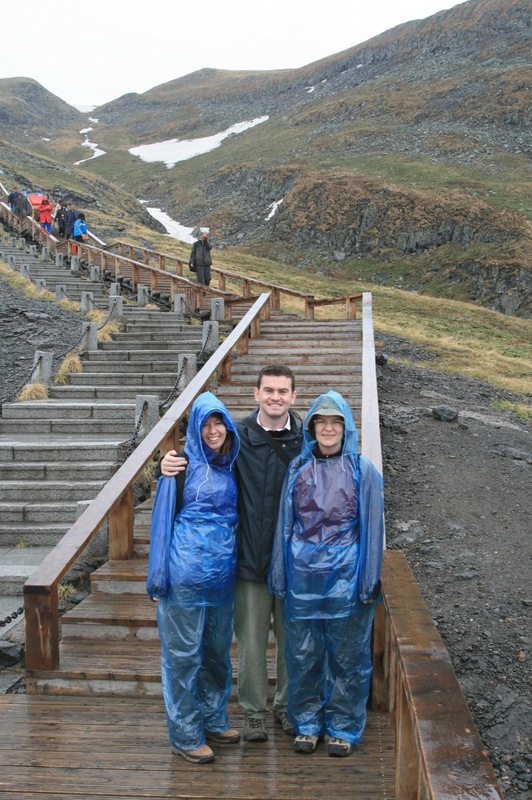 Finally, check out these images from John Holmes in Hong Kong. 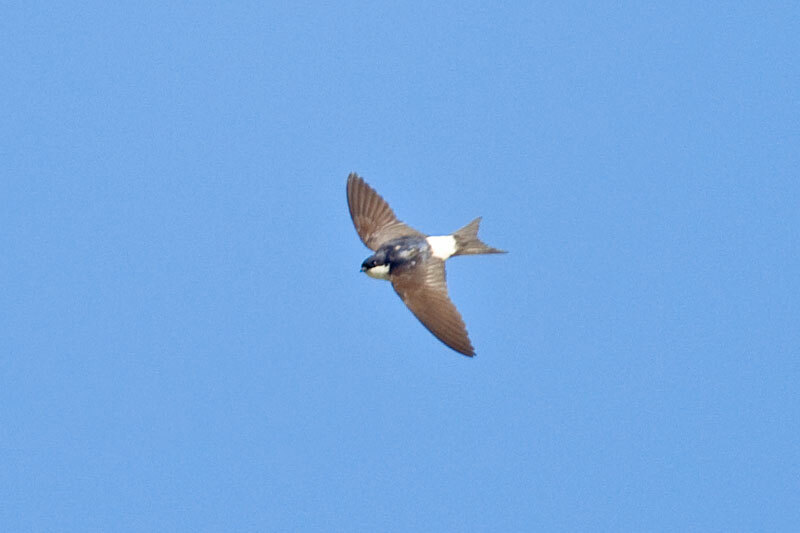 Asian House Martin often shows ‘dusky’ flanks and belly, whereas Northern usually shows bright white underparts. In summary, the combination of a smallish white rump (sometimes flecked), dark underwing coverts, ‘dirty’ flanks, a squarer tail and a darker ‘face’ are all characteristics associated with Asian House Martin. Maybe one will turn up at your migration watchpoint this autumn…? EDIT: I have added this image of an Asian House Martin taken at Chang Bai Shan that shows the dark feathering on the upper chin (ie just below the lower mandible). 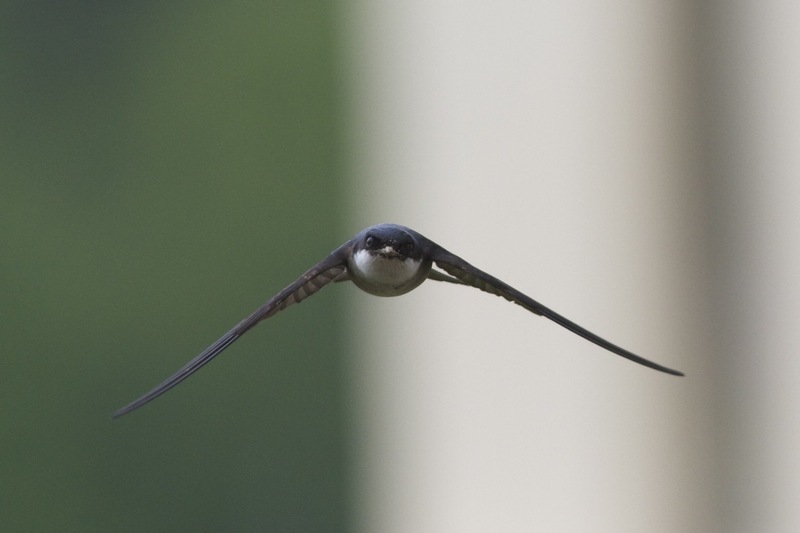 In Northern House Martin, the chin is white. Asian House Martin, Chang Bai Shan, 3 June 2012. This image shows the dark feathering immediately below the lower mandible, a good feature of Asian House Martin. Not so easy to see in the field, however! 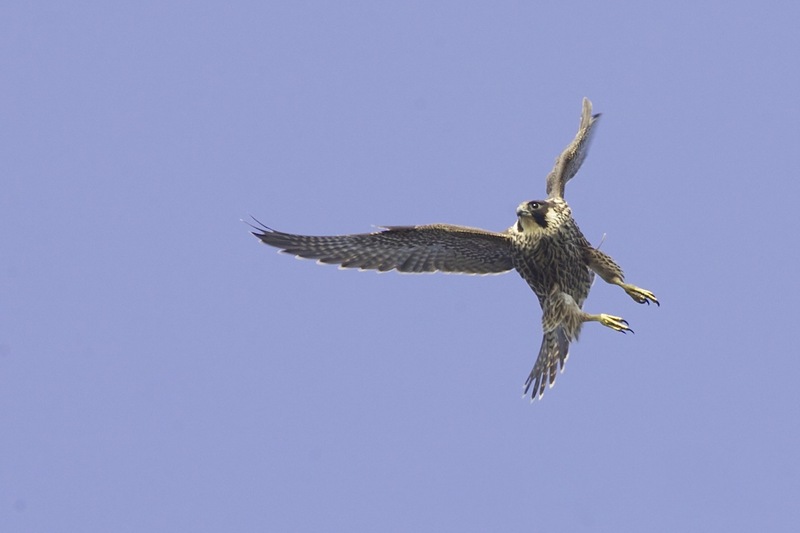 Peregrine, Laotieshan, 27 September 2011. A pair of these magnificent falcons is in residence at Laotieshan. Ashy Minivets, Laotieshan. Over 1,000 of these stunning birds were seen on Monday and one flock on Tuesday numbered at least 180 birds. 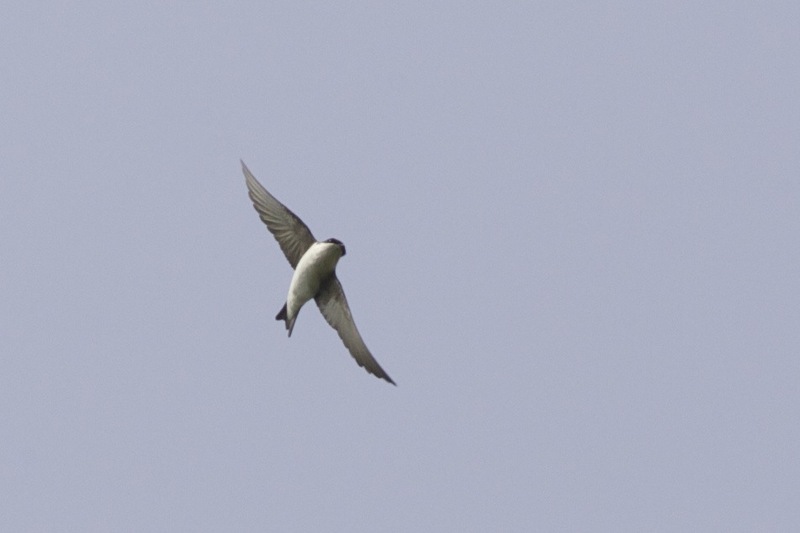 A record image of one of the Asian House Martins at Laotieshan today. Note the dark underwing coverts. Well, it didn’t rain but the wind did turn to the north and, with low cloud for the first few hours of Thursday morning, there were plenty of migrants about and we enjoyed an excellent day. We had planned our return flight deliberately to allow a full final day in the field and we were glad we did with two new birds in the last couple of hours of birding – White’s Thrush and Yellow-legged Buttonquail. The day started promisingly with lots of visible migration from the lighthouse. A few Yellow Wagtails, Chinese Grosbeaks, Black-naped Orioles and Fork-tailed Swifts were moving and the whole are seemed ‘birdy’ with singing Lanceolated Warbler in a bush next to the watchpoint and Asian Brown and Dark-sided Flycatchers seemingly on every available perch. Dusky and Radde’s Warblers called regularly from the scrub. It wasn’t long before Jesper picked up a calling Pechora Pipit as it flew overhead – the first of two – and a small flock of sparrows that landed in a tree next to the lighthouse turned out to be Russet Sparrows (after we scored the first record for this species in Liaoning Province earlier in our trip, it’s status has seemingly changed from rare to common in the space of a few days!). Or maybe it’s an unprecedented influx. Who knows? 3 Black Drongos dropped in to a treetop already holding 6 Chinese Grosbeaks and a Dark-sided Flycatcher and two of a flock of 6 Chestnut Buntings landed in a nearby tree, allowing excellent views of this very smart bird. 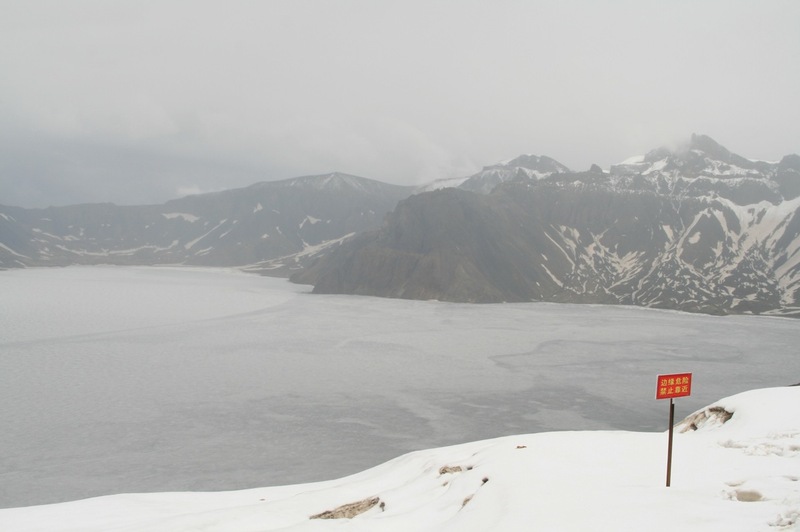 After an hour or so, Spike and I decided to leave Jesper and his group and walk up the ridge to gain a broader vantage point. From here we enjoyed more Black-naped Orioles, a group of 6 Asian House Martins that came in off the sea (the first of 9 in total for the day) and 3 more White-throated Needletails among over 100 Fork-tailed Swifts. A pair of Hawfinches toured the area around the lighthouse before heading inland and a Peregrine hung in the wind to the displeasure of the local magpies. A cuckoo (not identified to species) came in off the sea and a Chinese Sparrowhawk came in low and hugged the ridge as it made its way inland. This was quality vis-migging! 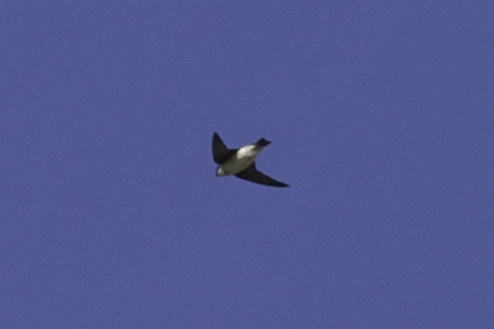 A record image of one of 9 Asian House Martins seen on 19th. The skies were very busy until about 0900 when the sun began to burn off the cloud and the flow of birds gradually slowed to a trickle. 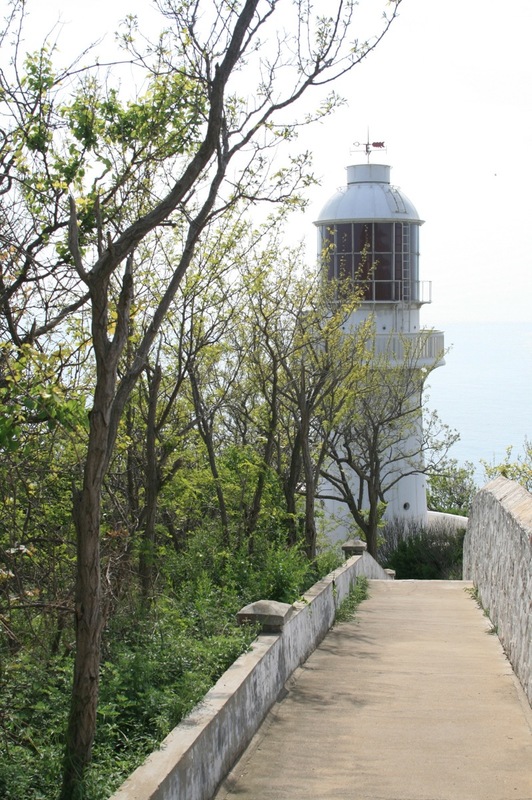 At this point we began to search the surrounding hillside, shrubs and lighthouse garden. Many new birds had arrived with good numbers of flycatchers, lots of Thick-billed Warblers, a sprinkling of phylloscs (including our first (singing) Arctic Warblers of the trip), Common Rosefinch, Black-browed Reed Warbler, Forest Wagtail, etc.. Everywhere we walked there were birds. Not a huge ‘fall’ but certainly a decent new arrival, clearly prompted by the change in wind direction (it was in northerlies that we enjoyed so many birds at the beginning of our trip). After a spot of lunch at the lighthouse car park, where the locals told us that “in September the sky is full of birds”, we began to explore a track that, at first we thought would just take us onto a piece of waste ground but instead looped round underneath the lighthouse through an area of sloped open woodland, some great gullies and coastal scrub. It was here that we flushed the Yellow-legged Buttonquail from a grassy verge on the entrance track to a seemingly abandoned hotel complex and, from a shaded gully, the White’s Thrush flew up and perched briefly before disappearing into the thicket above us. 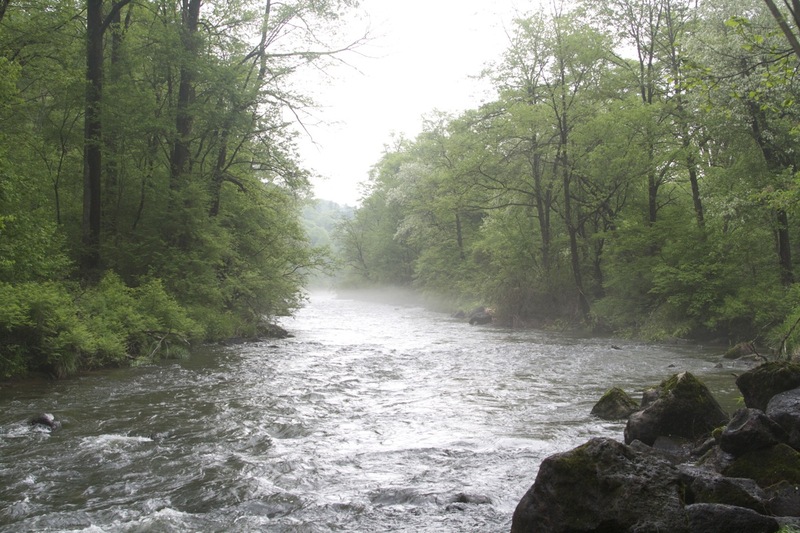 We wish we had discovered this area earlier as it obviously had great potential! I’ll post a full trip report in a few days, together with a full species list for the trip (over 150). 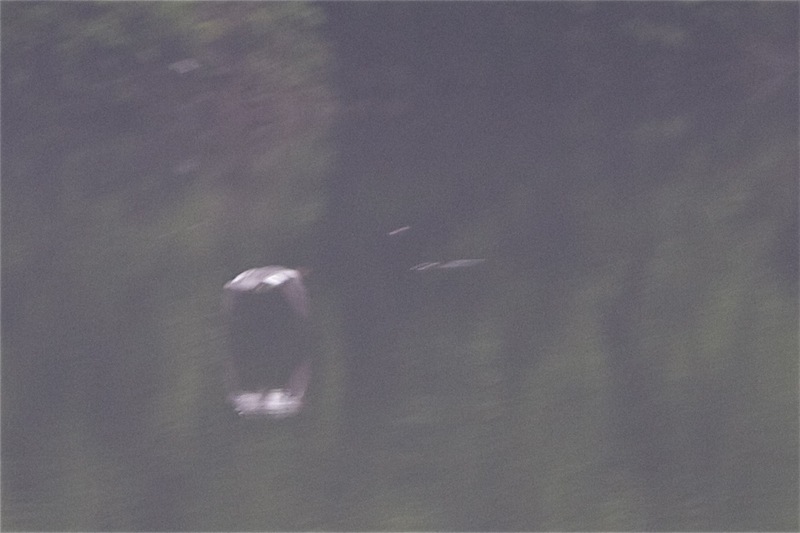 In the meantime, here are a few more images of the habitat and the species list for yesterday. 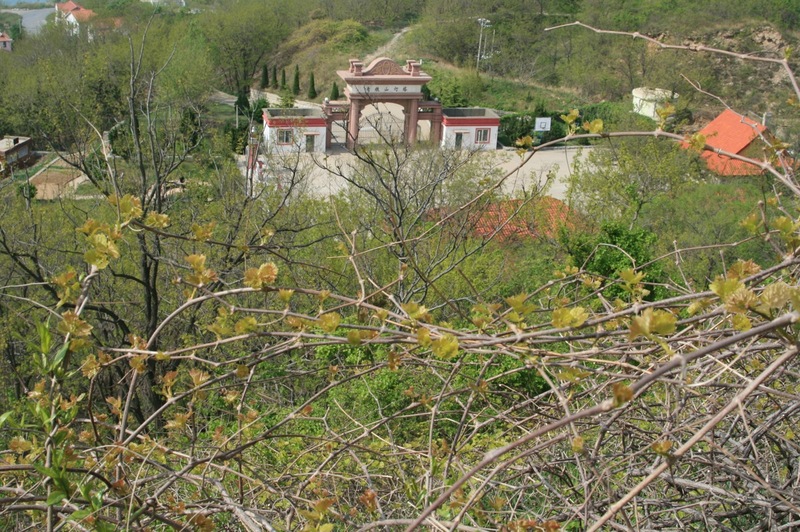 The view from the lighthouse across the garden to the entrance gate. 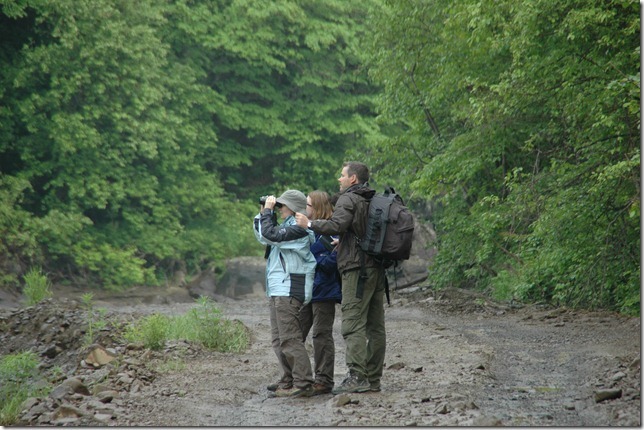 Pale Thrush and Rufous-tailed Robin were seen here. 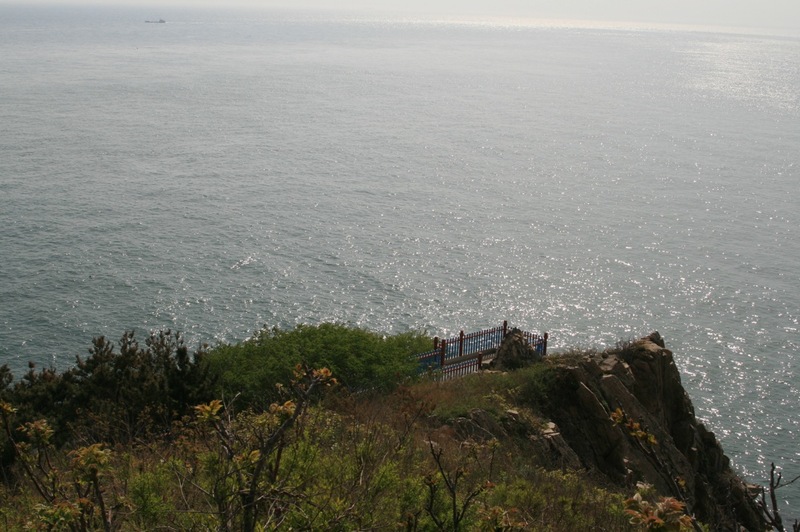 The seawatching point at Laotieshan lighthouse. We saw good movements of Streaked Shearwaters during our visit, mostly in the evenings. 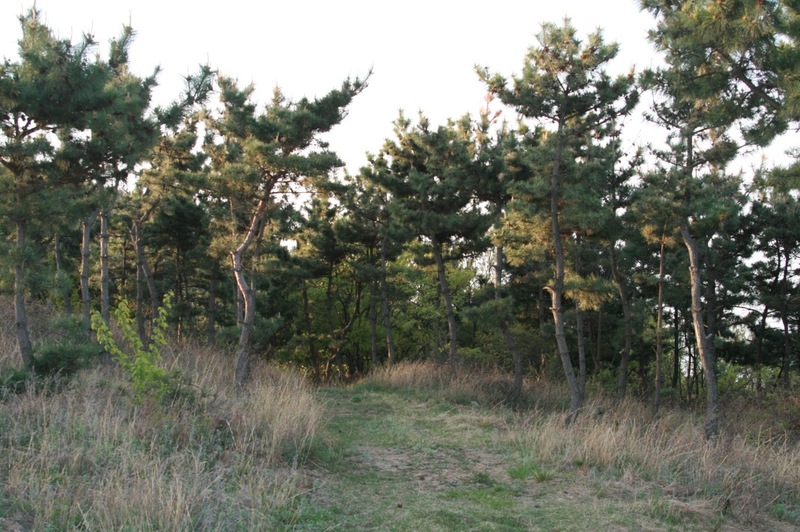 Typical habitat on the ridge... a series of trails make covering this area easy. After staying in Jinshitan following the wader bonanza, we enjoyed a relative lie-in until 0530 and were up and ready at the station to catch the first train to Dalian at 0630. 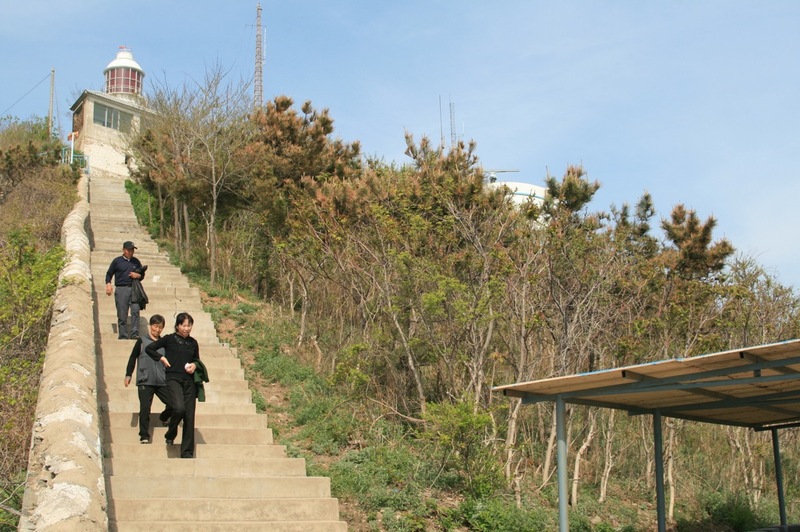 From there we took a bus (8 Yuan – about 80 pence) from Dalian to Lushun where we dumped our bags and set out straight for Laotieshan. We obviously missed the early morning visible migration but we were on site by 10am. 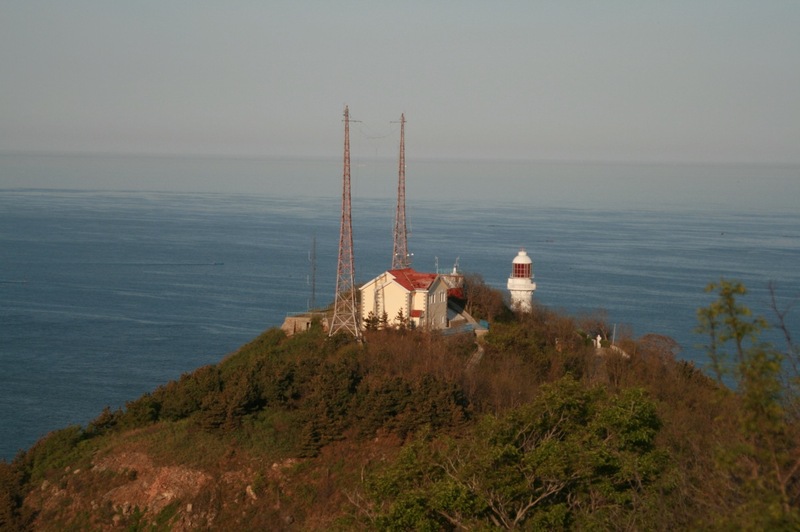 It was a gorgeous day with very good visibility and temperatures of around 20 degrees Celsius. Highlights include Asian House Martin, Red Collared Dove, 2 Mugimaki Flycatchers, a single Grey-streaked Flycatcher and, for the sheer spectacle, the hundreds and hundreds of hirundines – Swallows, Red-rumped Swallows, Sand Martins and Fork-tailed Swifts – that were feeding over the point all afternoon – simply awesome to watch these expert aviators hang, glide and swoop in the stiff north-easterly breeze.. I am posting a few images from today and also a couple of the ‘crabbers’ that were very active on the mudflats yesterday… maybe that’s why we didn’t see a Spoon-billed Sandpiper! These early mornings and full days in the field are starting to get to me.. I feel very tired this evening.. but hopefully I’ll be in bed by 9pm tonight and some good birds at first light tomorrow will no doubt wipe the sleep from my eyes! Have just set the alarm for 4am.. gulp. 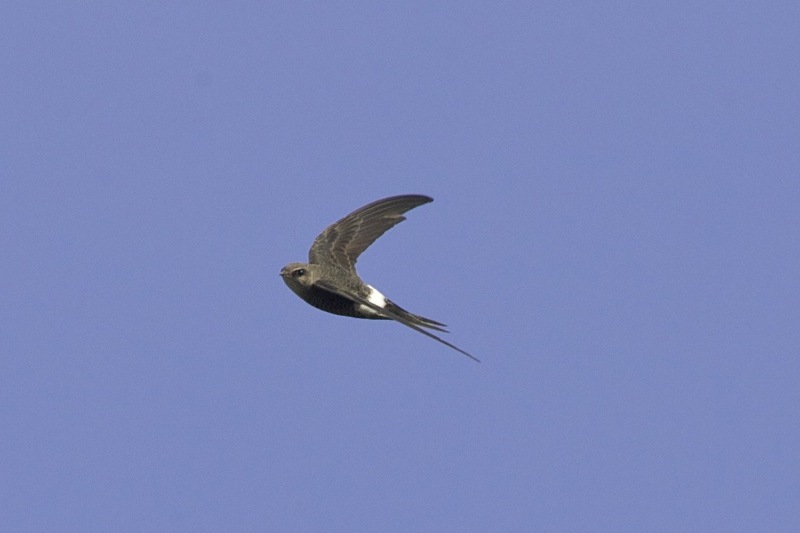 Fork-tailed (Pacific) Swift, Laotieshan, 15 May 2011. 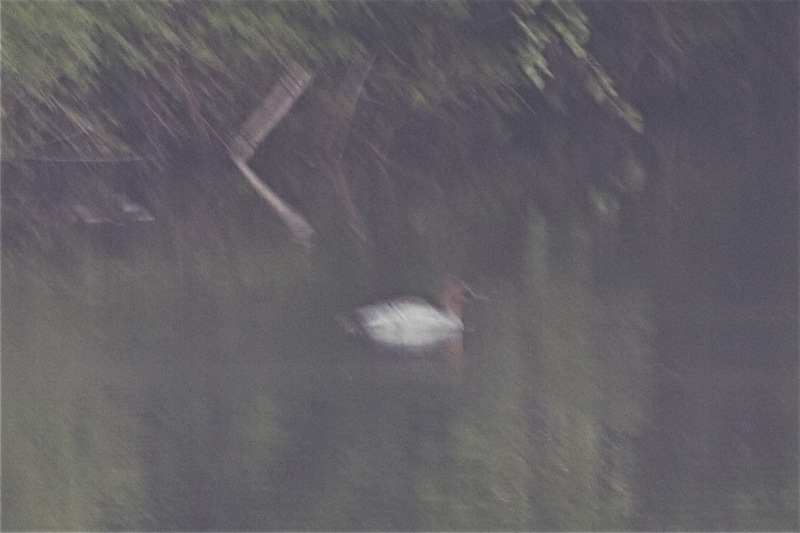 Note how the white rump wraps around onto the sides. 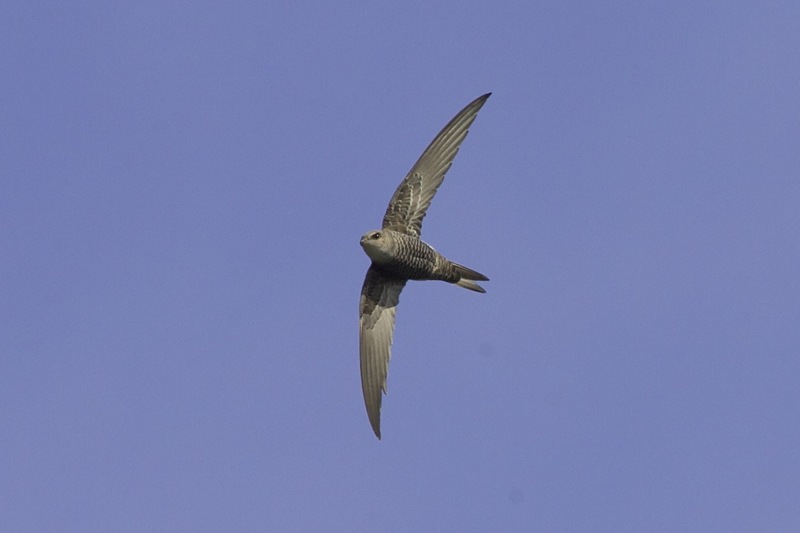 Fork-tailed (Pacific) Swift, Laotieshan. Hundreds of these superb birds were hawking around the point for insects all afternoon. 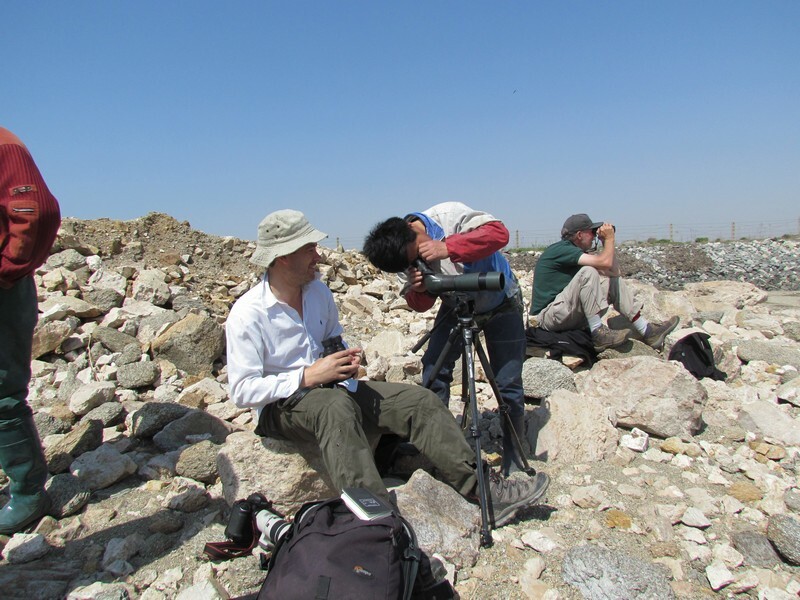 Record image of the Asian House Martin, Laotieshan, 15 May 2011. In the field this bird looked noticeably dusky on the underparts and there was no hint of pale underwing coverts. 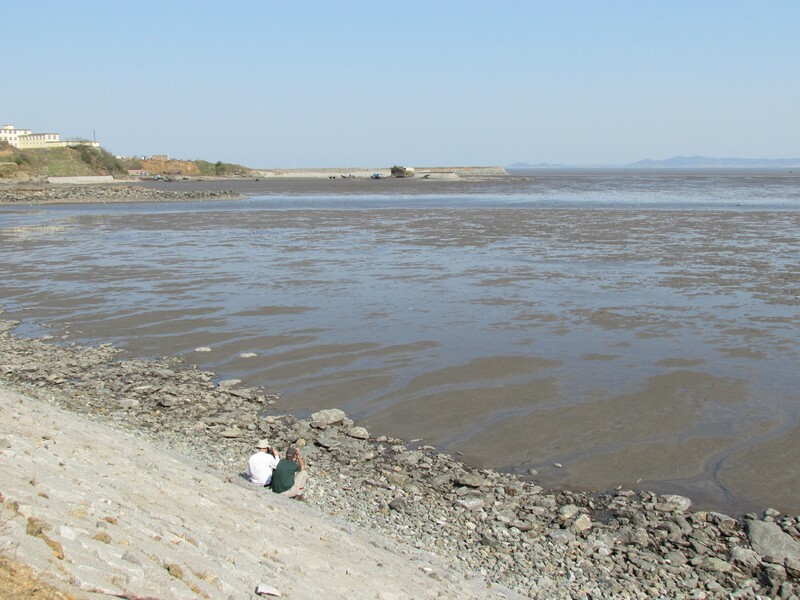 Watching the 'crabbers' paddle out to the mudflats on polystyrene rafts on the falling tide was an interesting sideshow to yesterday's wader-fest at Pikou. 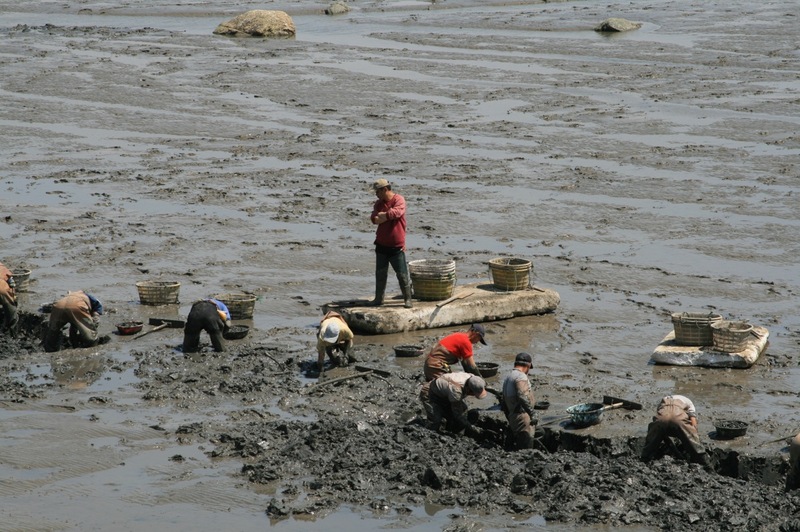 Digging for crabs/shellfish is hard work. The guy in the middle is clearly the boss. prob Oriental Cuckoo (1) in off sea at 1530. Heavily streaked underparts including streaked underwing coverts.